Note: The images in the obituary are not present in the original, but are included here to give further informaton on some of the details mentioned in the text. JOSIAH LATIMER CLARK, F.R.S., M. INST. C.E.—Tbe name of Latimer Clark is identified with the evolution of electric telegraphy by land and sea. This Institution will, however, always associate him primarily with the formation of its predecessor, the Society of Telegraph Engineers, of which, in 1875, he became the fourth president. Born at Great Marlow on March 10, 1822, he was a younger brother to the late Mr. Edwin Clark, whom he at one time assisted in his civil engineering practice. Latimer Clark studied chemistry at an early age, and his first connection with technical work was in the chemical manufacturing industry in a large Dublin establishment. Soon, however, he became impressed with the activity in the railway construction of the “forties,” which resulted in his joining, with many other young engineers, the great army of railway suryeyors. 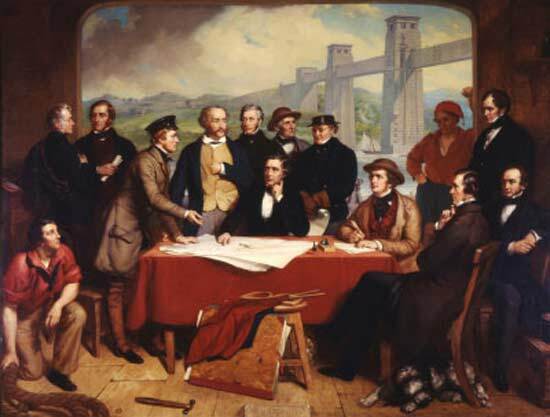 Latimer Clark assisted his brother Edwin, the Resident Superintending Engineer under Robert Stephenson, in the construction and erection of the Britannia Tubular Bridge across the Menai Straits. His work here covered three years – 1848 to 1850. Here it was that Latimer Clark was, in conjunction with his brother, in the habit of firing a time gun by electricity every evening at eight o’clock. This attracted the attention of the chairman of the then newly-formed Electric Telegraph Company (the late Mr. John Lewis Ricardo, M.P. ), who soon afterwards, in 1850, invited him, as well as his brother Edwin, to join the staff; the result being that Edwin Clark became their chief engineer, and Latimer assistant engineer. This was Latimer Clark’s introduction to the subject of electric telegraphy – then in its infancy. In his new position he superintended the construction of much of the telegraphic system of this country, and three years later, on the retirement of his brother, became engineer-in-chief, which position he held for seven years until 1861, when, on his private professional practice promising to become considerable, he became consulting engineer to the company, remaining so till the Government took over the telegraphs of the United Kingdom in 1870. Clark’s talents as a discoverer, largely represented in patents, soon made themselves apparent. In 1853 he invented an exceedingly ingenious camera for taking stereoscopic pictures with a single lens (see Journal of the Photographic Society, May 21, 1853). In those days it was practically impossible to obtain a pair of lenses of the same rapidity and of identical focal length. This was followed in 1854 by the ingenious and important system of applying air pressure to the conveyance of letters, parcels, or telegraphic messages, which he invented and introduced into practice through the Pneumatic Despatch Company, a system which was afterwards developed by the late Mr. C.F. Varley, and which is now so extensively used by the Post Office for the transmission of telegrams from branch offices to the General Post Office. 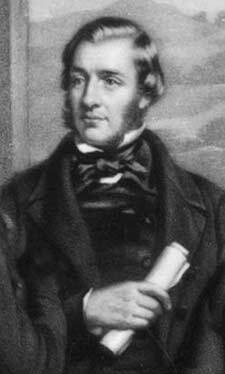 About this time, too – independently of similar investigations by the late Sir Charles Bright – Latimer Clark conducted a long series of experiments on the retardation of electricity through underground telegraph wires laid between London, Leeds, and Liverpool, which went to show that the “rate” of flow or variation in the strength of an electric current was in no way influenced by mere potential difference – or tension, as it was then termed. It was in connection with this latter demonstration that Latimer Clark first came prominently to the fore. At the request of Professor Airy, his experiments were repeated before Professor Faraday, and subsequently formed the subject of a lecture at the Royal Institution in January, 1854 (see Faraday’s “Experimental Researches,” pp. 508-517). Two years later (1856) he introduced his well-known double cup insulator for land telegraphs, and a short time after his differential galvanometer. At first the Electric Telegraph Company confined their attention to constructing and working land telegraphs. Latimer Clark, however, also acted in a technical capacity to the International Telegraph Company, and was thus associated with the laying of some of the earliest submarine cables from this country to Holland, Belgium, &c., between 1853 and 1855. About the latter date the “International ” Company was absorbed by the Electric Telegraph Company under the style of the “Electric and International Telegraph Company,” with Latimer Clark as engineer-in-chief. In 1857 he became associated with the then Astronomer Royal (the late Sir J.B. Airy) in devising a method for indicating Greenwich mean time throughout the country. At this time also Mr. Clark suggested to Professor Airy the establishment of magnetic observatories furnished with wires to act as feelers in connection with the approach of storms. In 1860 Latimer Clark served on the joint Committee instituted by the Board of Trade and the Atlantic Telegraph Company to inquire into the construction of submarine cables. In addition to the assistance he was able to give the Committee as an ordinary witness, and by making investigations, Clark put in an elaborate supplementary report, on the laws which govern the propagation of the electric current in long submarine cables, resulting from his previous investigations on the subject already alluded to. This report constituted Appendix II. in the Blue Book, and was certainly one of the most valuable pieces of evidence drawn forth. In June, 1860, Latimer Clark became professionally associated with the late Sir Charles Bright. The combination proved a strong one, for the firm of Bright & Clark served as supervising engineers to the construction and submersion of most of our early telegraph cables. In the first year of the partnership Mr. Clark joined with Sir C. Bright in a paper read before the British Association on “Electrical Standards and Units,” which led to the formation of the Committee on Standards of Electrical Resistance which has since done much useful work. Latimer Clark at the time of the Persian Gulf cable. As engineers to the first Persian Gulf cable to India in 1863, Messrs. Bright and Clark conducted a series of experiments with the core of that cable to ascertain the effect of temperature on the insulation resistance of gutta-percha. 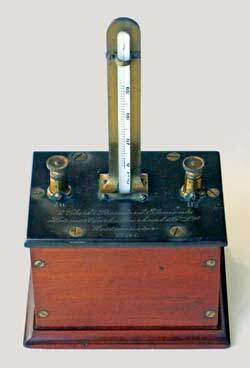 From those experiments, which were described in a paper read by Sir Charles Bright before the Institution of Civil Engineers on “The Telegraph to India,” the formula for correcting the resistance to a standard temperature was arrived at. This is now in everyday use by cable electricians. 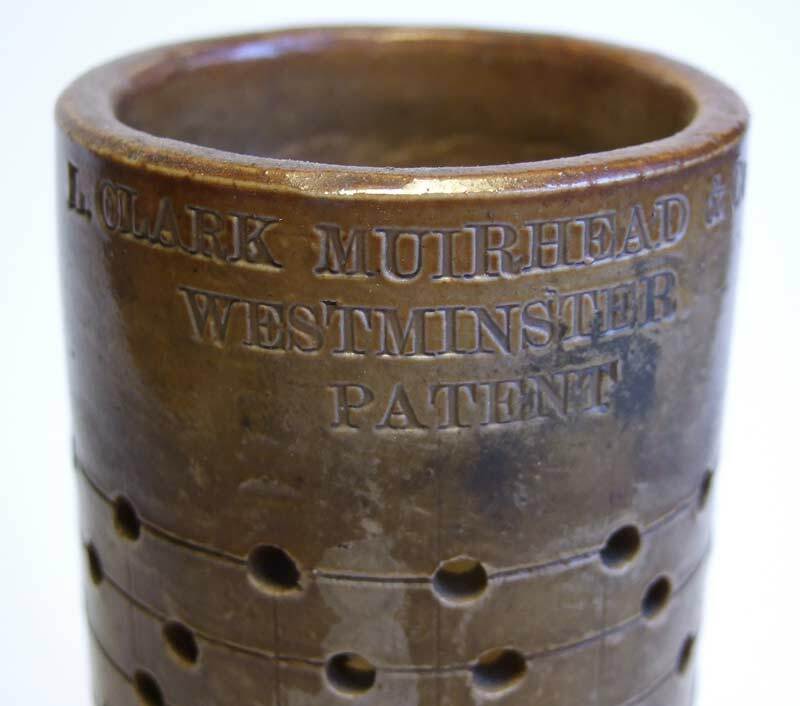 Though the bituminous composition for protecting cables, patented in 1858 in the names of Clark, Braithwaite, and Preece (known as “Clark’s Compound ”), did not prove a success—and had to be abandoned after a single trial, mainly on account of the method of application adopted, the Bright and Clark system,’ first used on this same Indian Government cable, has ever since been universally employed for preserving the iron sheathing wires. [See Sir C. Bright’s Specifications, Nos. 466 and 538 of 1862.] When returning from one of the Indian Telegraph expeditions, in September, 1869, Mr. Clark had the misfortune to be shipwrecked in the s.s. Carnatic off the island of Shadwan in the Red Sea; and it was only his great physical strength that enabled him to swim ashore, despite a dislocated shoulder and a broken collar-bone. Messrs. Bright and Clark acted as engineers to the Anglo-American Telegraph Company for the purposes of the second and third Atlantic lines. After the two cables (of 1865 and 1866) had been successfully laid, Latimer Clark, on behalf of his firm, tested and sent signals through the entire length. On September 25, 1868, the partnership of Bright and Clark was dissolved, and a little later Latimer Clark joined with Mr. H.C. Forde and with Messrs. Charles Hockin and H.A. Taylor in the consulting firm now existing under the name of Clark, Forde, and Taylor, and in association with his partners supervised the manufacture and laying of some 100,000 miles of submarine cable in all parts of the world. Latimer Clark Muirhead & Co. Ltd. It is not, however, only electricity in its application to telegraphy which has benefited at Clark’s hands—electrical science generally also owes him a debt of gratitude. The zinc-mercury standard cell—the electrician’s practical standard of potential difference—is, no doubt, what will hand down the name of Latimer Clark to posterity in electrical science; for the use of this invention, in the laboratory as well as in practical testing, is almost unbounded. This followed on an exhaustive series of experiments with the Daniell Cell, variously constructed with a view to obtaining, if possible, a satisfactory standard of electromotive force therefrom. In these experiments Mr. Clark was greatly assisted by Mr. J.C. Laws and Mr. Frank Lambert (both since deceased) as well as by Mr. Herbert Taylor. The standard cell was first introduced to the public in 1873 by Mr. Clark in a paper entitled “A Standard Battery of Constant Electro-motive Force,” read before the Royal Society. 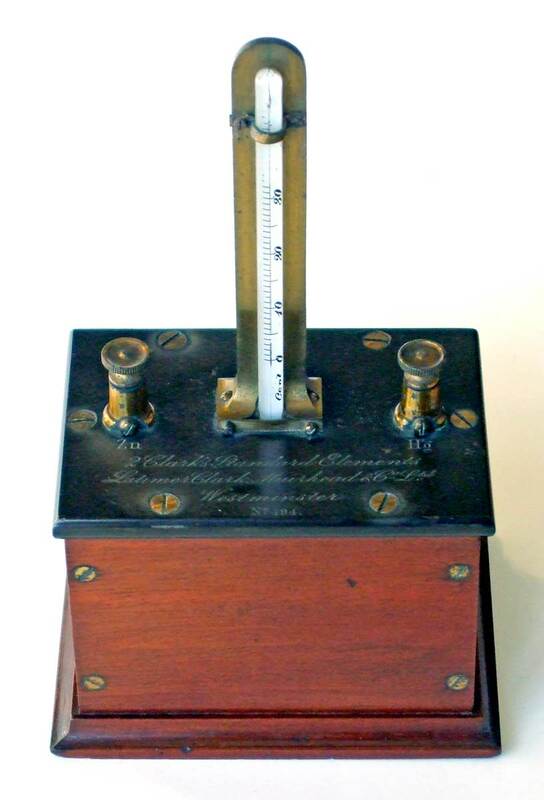 Whilst speaking of Latimer Clark’s scientific electrical researches we may mention that some of the earliest investigations on the effect of self-induction in electrical work may be ascribed to him; for Clark made a valuable contribution to telegraphic progress in his study of the errors due to the inductive action of a galvanometer needle upon its own coil when using shunts of different values in a series of comparative discharges (see his paper in the Journals of the Society of Telegraph Engineers in 1873—“On a common source of error in the measurement of currents of short duration when using galvanometers with shunts ”). 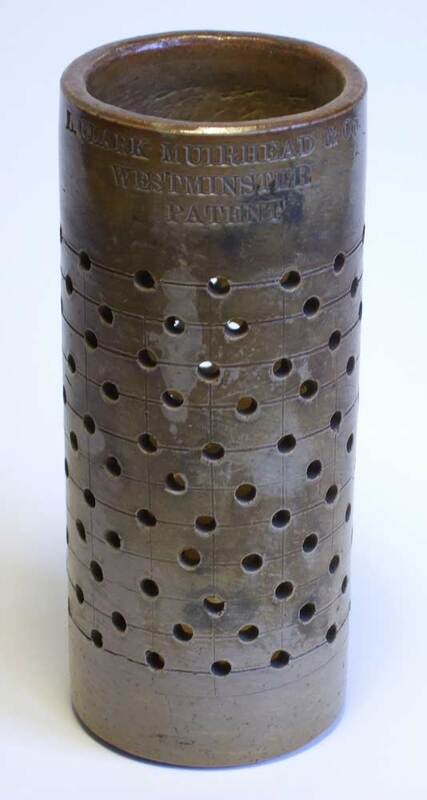 Inner jar from a manganese battery patented by Warden, Muirhead and Clark in 1876: "Improvements in Galvanic Batteries"
In addition to his consulting work, Latimer Clark also figured as an electrical contractor, being senior member in the late firm of Latimer Clark, Muirhead & Co., formed in 1875 as the outcome of Warden & Co. This firm were large manufacturers of electrical apparatus and machinery generally. They were the responsible contractors for one of the earliest house-to-house electrical supply companies in London—the St. James’s and Pall Mall Electric Lighting Company. This was, perhaps, the first entirely successful concern of its kind, Mr. Clark being an active director, while its formation was largely due to the late Mr. John Muirhead, his partner. But, apart from this, the latter part of Latimer Clark’s life was much taken up with electric lighting developments in a technical sense. Latimer Clark was not only a telegraph engineer and electrician, he was also a civil engineer in the broadest sense. Few are able to cope with so varied a sphere of work; few acquire so wide a field of knowledge and information. In 1874 there was commenced that association with Mr. J. Standfield (represented by the firm of Clark and Standfield) which resulted in many improvements in floating docks. His brother Edwin had designed the earlier hydraulic docks, but of greater efficiency and ability proved the single and double-walled docks now widely used. Many of these have been built since 1872 with a lifting power ranging up to 11,000 tons. Latimer Clark was a devotee of astronomy; and in 1882 introduced his little transit instrument which has done much to popularise this most fascinating branch of science. Simple, yet effective, this instrument has enabled many who could not afford to buy costly apparatus to follow the stars. Clark wrote more than one astronomical work, amongst them a treatise that could be followed without previous knowledge—a true popular educator. The kindred science of microscopy also found in him a student, as did also botany; and at his house at Upper Norwood he used at one time to make a special study of rare Alpine plants. Throughout his life Clark was an ardent bibliophile; and his library, so far as electrical works are concerned, was unequalled. In this collection and in the preparation of catalogues he found congenial employment for his leisure hours. A close student of telegraphic history, Latimer Clark was always very much impressed with the great services performed to electrotelegraphy by the late Sir William Fothergill Cooke on the one hand, and the late Mr. Jacob Brett on the other. 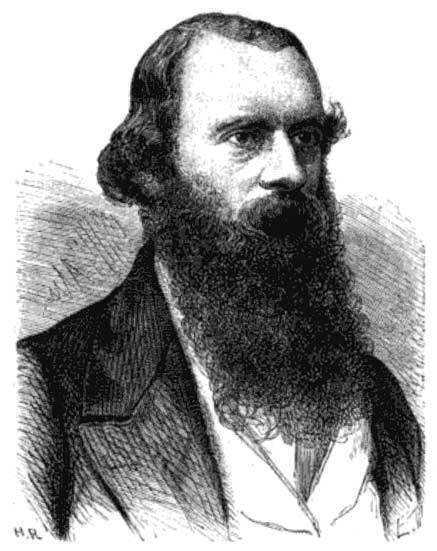 Clark’s writings were always characterised by painstaking precision and accuracy; and a notable example of this may be found in his historical description of the part played by Sir W. F. Cooke, contributed to the journal of this Institution (then the Society of Telegraph Engineers) soon after his death in 1879 [Journal, vol. viii. p. 361]. In his later years Jacob Brett lived almost in penury, and Clark exercised all his energies to obtain him a Civil Service pension, in which effort he was at length successful. The income so obtained was, however, altogether insufficient; and Clark, along with others, made a further effort in the direction of obtaining him an increased pension. It seemed as though this were on the point of being realised, when poor Brett died at the beginning of 1897. After Jacob Brett’s demise Mr. Clark presented all the valuable papers and volumes of the Brett brothers to this Institution, as, indeed, he had done previously in the case of Sir William Cooke. He himself (Latimer Clark) lived but another year dying quietly and suddenly, at the ripe age of seventy-six, on October 30, 1898. The funeral took place at Kensington Parochial Cemetery, near Hanwell, when the Council of the Institution were largely represented, and a number of other engineers and electricians were present. The name of Latimer Clark will always be prominently associated with pioneer electric telegraphy—land and submarine—and his death is to be deplored by his professional brethren. As before stated, besides being associated with the founders in the formation of the Institution and a life trustee, Latimer Clark became President in 1875, the fourth year of its existence as the Society of Telegraph Engineers. His inaugural address on taking the chair contained an interesting and valuable account of the early history of the electric telegraph. Clark joined the Institution of Civil Engineers as an Associate in 1858, and in 1861 was created a full member. He was elected in 1889 a Fellow of the Royal Society. He was also a Fellow of the Royal Astronomical Society, of the Royal Geographical Society, and similar institutions interested in the pursuit of science. Moreover, in recognition of his services to engineering and scientific advancement, he became a chevalier of the Légion d’honneur some years before his death. The personality of Latimer Clark was, perhaps, mainly characterised by the wonderful rapidity with which he accurately grasped the salient points of a problem. He seldom made a technical error in engineering or electrical work; moreover, he was, on the whole, fortunate professionally. He had the advantage of considerable foresight and a good knowledge of the world, aided by a large share of common sense. Latimer Clark’s library, assembled over his long career in the industry, was the most comprehensive collection of material on electricity and telegraphy of its time. After Clark’s death, the collection was bought in 1901 by Schuyler Skaats Wheeler of New Jersey, who donated it to the American Institute of Electrical Engineers in New York, where it became known as the “Wheeler Gift Collection.” A two-volume catalogue of the collection was published in 1909, listing almost 6,000 items. The Library to remain in New York City and to be a reference library, free to all, including non-members and available for consultation at least three days in the week and some evenings and some Sundays, as soon as the Institute is in permanent quarters. In 1913 the Engineering Societies Library was established in New York City, a joint venture of the AIEE, the ASME (Mechanical Engineers), and the AIME (Mining Engineers), funded by a $1.5 million gift from Andrew Carnegie. The AIEE’s main contribution to the Library was the Wheeler Gift Collection. For many years the collection was accessible according to the terms above, but in the 1990s the ESL decided that it could no longer maintain its Manhattan premises and closed the library there. By that time the Wheeler Gift Collection had been merged with other works at the library, and had suffered from neglect over the years, much of the material being kept in poor physical conditions. A 1985 survey of the collection showed about 9% (532 items) were missing, and it seems unlikely that the situation improved in the following ten years, prior to the dispersion of the collection. Constrained by the terms of the Gift to keep the collection in New York City, the ESL boxed up whatever could be definitely identified as part of the original Wheeler Gift and in 1995 sent 205 cartons of books and papers to the Humanities and Social Sciences division of the New York Public Library at 42nd Street. The rest of the collection, including items in the 1909 catalog that were part of the Wheeler Gift but did not have identifying labels, went to Linda Hall Library in Kansas City, MO. Catalog of the library of Josiah Latimer Clark, purchased in 1901 by Schuyler Skaats Wheeler, and presented by him to the American Institute of Electrical Engineers. The library of the Institute was consolidated in 1909 with the libraries of the American Society of Mechanical Engineers and the American Institute of Mining Engineers to form the Engineering Societies Library. Perhaps the NYPL should consider letting Google Book Search scan and index the Wheeler Gift Collection. That would at least fulfill Wheeler’s condition that the collection be publicly and freely accessible. As noted in the obituary above, in 1853 Latimer Clark “invented an exceedingly ingenious camera for taking stereoscopic pictures with a single lens.” This 1861 book on photography gives further details. by T. Frederick Hardwich, Sixth Edition, 1861. Mr. Latimer Clark has devised an arrangement for taking stereoscopic pictures with a single Camera, which is exceedingly ingenious. Its most important feature is a contrivance for rapidly moving the Camera in a lateral direction without disturbing the position of the image upon the ground glass. This will be understood by a reference to the following woodcut. “A strongly-framed Camera-stand carries a flat table, about 20 inches wide by 16, furnished with the usual adjustments. Upon this are laid two flat bars of wood in the direction of the object, and parallel, and about the width of the Camera asunder. They are 18 inches in length; their front ends carry stout pins, which descend into the table and form centres upon which they turn. Their opposite ends also carry similar pins, but these are directed upwards, and fit into two corresponding holes in the tailboard of the Camera. “Now when the Camera is placed upon these pins, and moved to and fro laterally, the whole system exactly resembles the common parallel ruler. The two bars form the guides, and the Camera, although capable of free lateral motion, always maintains a parallel position. In this condition of things it is only suited to take stereoscopic pictures of an object at an infinite distance; but to make it move in an arc, converging on an object at any nearer distance, it is only necessary to make the two guide-bars approximate at their nearer end so as to converge slightly towards the object; and by a few trials some degree of convergence will be readily found at which the image will remain its it were fixed on the focussing glass while the Camera is moved to and fro. To admit of this adjustment, one of the pins descends through a Slot in the table and carries a clamping-screw, by means of which it is readily fixed in any required position. 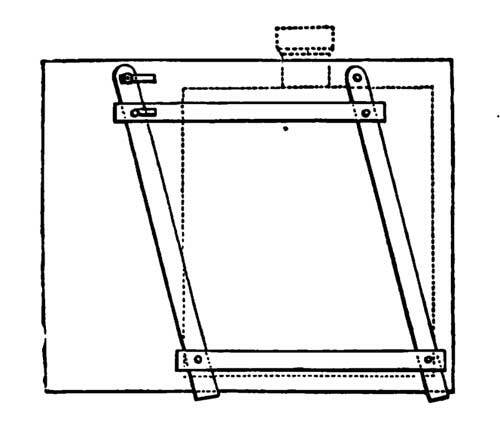 In addition to this arrangement for moving the Camera laterally, the slide for holding the sensitive plates must be modified from the common form. It is oblong in shape, and being about ten or eleven inches long, requires some little adaptation to fit it to the end of an ordinary Camera. The glasses are cut to about 6¾ inches by 3¼; and when coated with Iodide of Silver, the two images are impressed side by side, the plate being shifted laterally about 2½ inches, at the same time and in the same direction as the Camera itself. The operation of taking a portrait is thus performed. 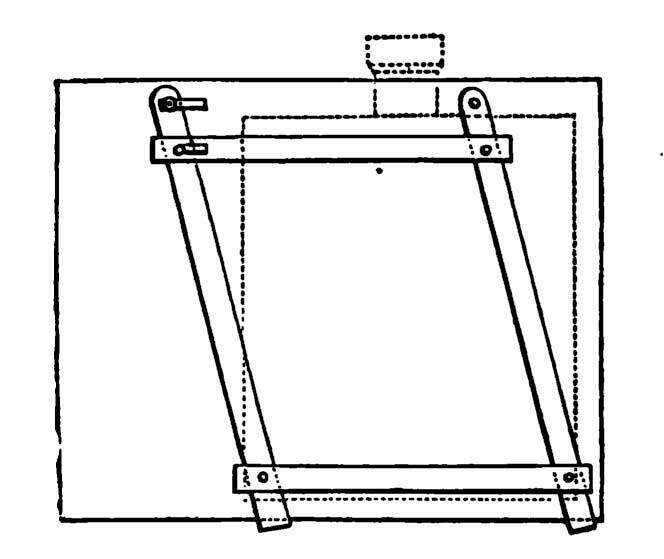 The focus having been adjusted for both positions, and the Camera and the slide both drawn to the left-hand, the door is raised and the plate exposed; the Camera and the slide are then shifted to the right-hand, and the plate in its new position having been again exposed, the door is closed and the operation completed. Pictures taken with this instrument do not require to be reversed in mounting, the left picture being purposely formed on the right-hand side of the glass. In choosing between the Latimer Clark Camera and the Camera with twin Lenses, the operator will be guided by circumstances. If he wishes to take pictures nearly instantaneous, two separate Lenses will be a sine qua non, but the effect in the Stereoscope is not so decided, and to the eyes of many, the relief of rather distant objects will be imperceptible. The Writer does not attempt to settle this vexed question, but he is informed by vendors of Stereoscopic slides, that as a rule, preference is given to those taken at a wide angle.